I just love this time of the year when the air is getting crisper, the leaves begin to fall, and the most beautiful colors of the season come out. The Cat's Pajamas challenge 324 is all about Fall colors! For my card, I used the Leaves Cut Up's which are embossed with 3 different color powders to create the look of falling leaves. I put a small strip of gold shimmer card stock down the side of the card before popping up the leaves. The sentiment is from the Wreath Building set and the card was completed with a few dots of a glitter gel pen throughout. We hope you play along and share your Fall creations for your chance to win a TCP gift certificate! Thanks for stopping by and have a great Tueday. 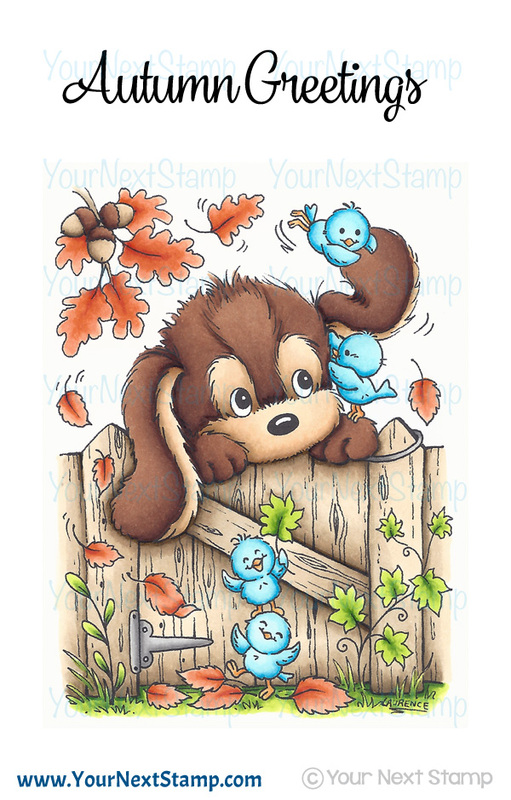 The first day of Autumn and Your Next Stamp is holding its monthly Feature Day with the DT. This month's theme is something spooky/scary. 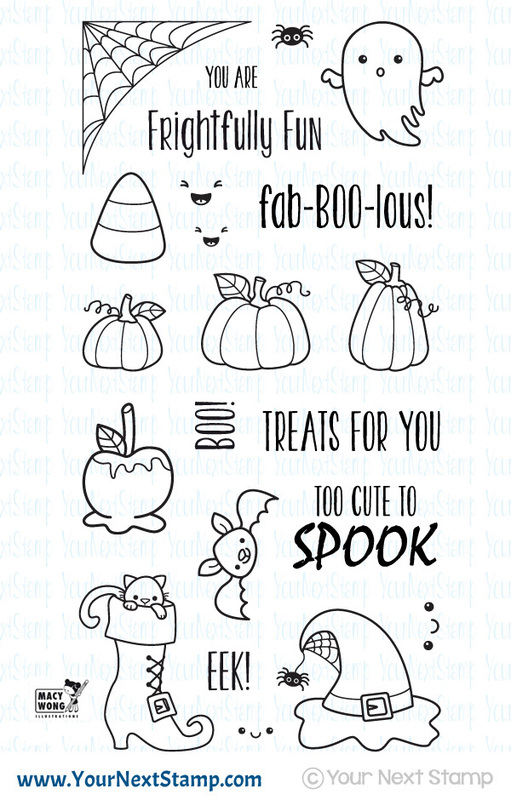 With Halloween just around the corner and the newest release from Your Next Stamp, it is not hard to get those creative juices flowing coming up with something fun. For my card, I created a background using different colored Memento inks. Amazing what a camera picks up. The colors are truly "melting" into one another in person, but the camera really pick up the separation of it. Once the background was complete and using the Happy Haunting die set, I cut out the web with vellum to give it a little transparency and then went over it with a glitter pen. The spider and ghosts were popped up before stamping a sentiment from Fab-Boo-lous Halloween in the center. Be sure to stop over at the YNS Blog to see all the scary creations the team has put together. 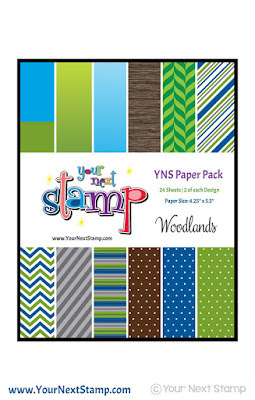 Don't forget to leave a little love for your chance to win a stamp set of your choice! Thanks for stopping by! It is another Friday challenge with Your Next Stamp and it's a good one to get you ready for those lush autumn colors that you can pair with a super fun sketch! For my card, I am using the newly released set of Fab-BOO-lous Halloween and it's matching die set to create this very Halloween-y card. Following the sketch in the challenge, I created the look by using various patterns in this paper collection from Doodlebug & Co. I just love it and know that it's a few years old, but I still have a bit more in the pack that I just had to compile a look of different patterned paper along with the super cute image which I paper pieced. 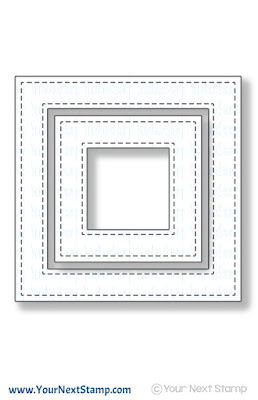 For the circles, I used the Circles with Dots and Stitching die set, while the center panel was cut using the Stitched rectangle die set. I finished the look by using the Bookmark/Tag die set for the sentiment and some fun Spellbound gumdrops. We hope you are able to play along in the challenge and don't forget to link up your creation on our challenge page for your chance to win! Thanks for stopping by and have a great weekend! It's time for another TCP Tuesday Challenge and here's one that for some, will be a challenge! It's all about playing with patterns. If you like me, you hoard, eh hem... I mean you collect some really pretty paper and this challenge is perfect for using some of those pretty papers! I am using the ever cute set of Kitschy Kitchen and some fun paper from both October Afternoon and Lawn Fawn to create this combination. Sometimes I have trouble creating something with many different patterns, but I enjoyed figuring it out and going a bit outside my comfort box. The images were colored with Copics and fussy cut to be popped up on the star. The sentiment was stamped directly onto the pattern paper. We hope you do join us in this fun challenge and you can find all the details on the TCP Blog. We can't wait to see what you create! Have a great day! Hey everyone! It's that time to showcase a dare challenge from the YNS DT. This month our dare is Fall Colors and who doesn't love that? Fall is my favorite season- aside from flip flop season! :) Because who doesn't love wearing sandals when not wearing a sweatshirt? Hahaha.. Using various color of Momento ink, I stamped up some of the leaves around the edges of the top panel before matting that on top of the glitter card stock. I added a small strip of the cs to glue to the center before added the sentiment Fancy Thanks sentiment die cut to the top. A small word of 'Give' was added to the top corner for a more seasonal feel. I did add some clear glitter gel pen to some the leaves around the edges, but it did not show in the photo. It's there though! 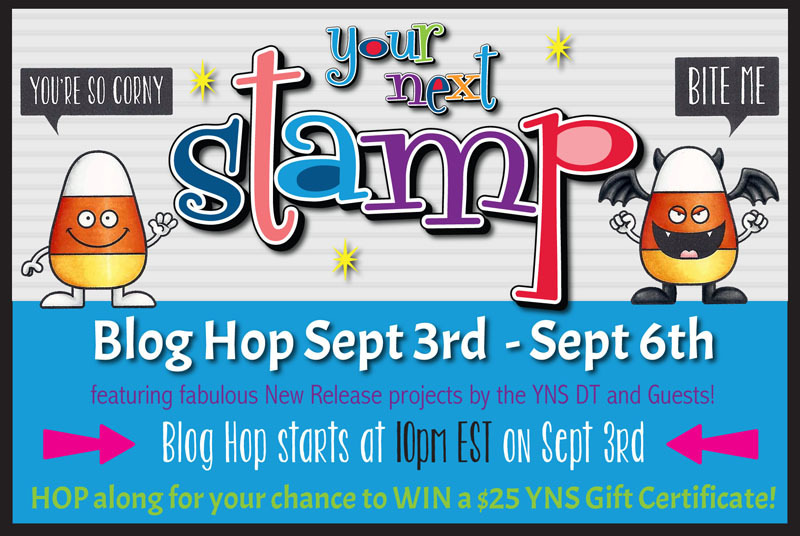 Be sure to stop by the YNS Blog to leave a little love and see all the fabulous DT creations! Thanks for stopping by! 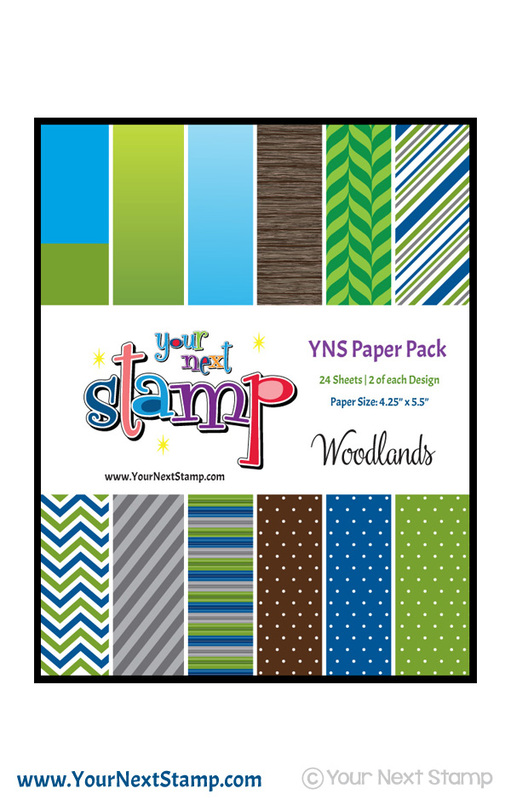 It's new release time with Your Next Stamp and get ready for some awesome products to get your fall creative mojo in check! Not to mention there is another new paper collection that is just perfect for not only the season, but for masculine cards! For my first card, I am using the super adorable Autumn Leaves set. This image is just darling and could be used for various seasons. I colored the image with Copics and layered over one of the patterned papers in the NEW collection this release. That collection is called Woodlands. 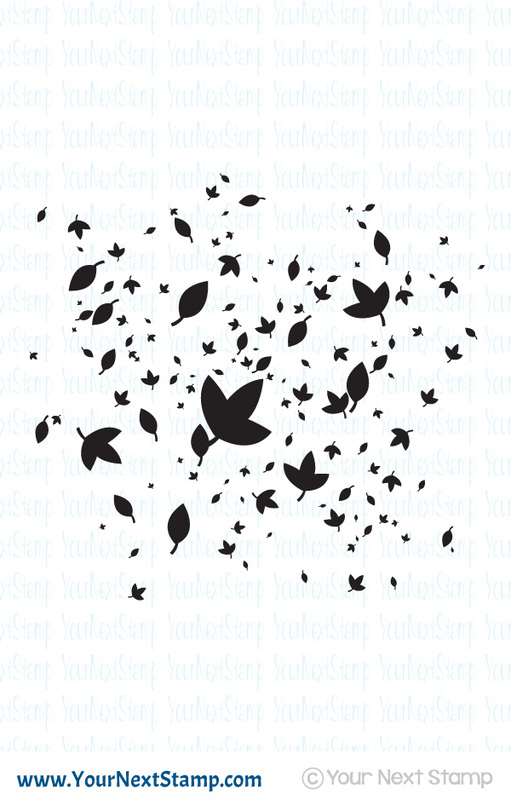 For my next card, I am using the large Leave Splatter stamp. I created this with various color ink for the inside leaves. For the frame, I used my Distress Inks with some water to blend them a bit on regular cs. I then stamped the leaves and embossed them with some copper ep. 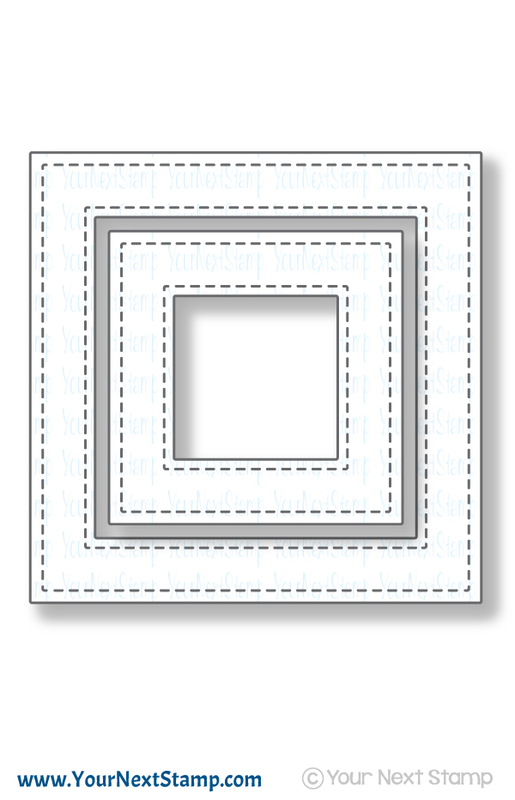 Using the new Stitched Square Frames die, I cut out the frame for the inside leaves. It was finished with the sentiment from Autumn Leaves and placed across. As always, Karen has a sweet deal for you to get all your favorites with an awesome sale!! 20% off your entire order! You don't want to miss out! Be sure to continue to hop along and leave some love for your chance to win! It's sneaky peek time for September's release of Your Next Stamp! This release includes another awesome collection of patterned paper, along with some creative dies and stamps to make your crafty mojo into the Fall season perfect! 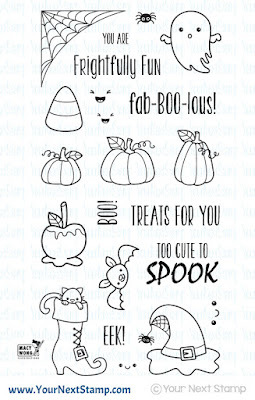 For my sneak peek, I am using the adorable set of Fa-boo-lous Halloween to create a whimsical, yet simple card to send for the holidays. I started with a white cs base and figured out where I wanted to place my patterned paper. I lightly drew a line to stamp the ghost so that he is peeking out from the paper. The patterned paper is from Doodlebug & Co. which is just a strip and a thinner green cs strip is glued at the top. I then stamped another ghost in the center and thought by the look on his face, the cute little spider could be coming down from her web to scare him! The web is a little hard to see but it was stamped in white craft ink and heat embossed in an iridescent color. I hand drew the web she is coming down on and finished the ghosts with some Wink of Stella to add more sparkle. I added the sentiment to the top, added some fun Gumdrops, and also added the sentiment 'Boo' to the bottom that was heat embossed in white. 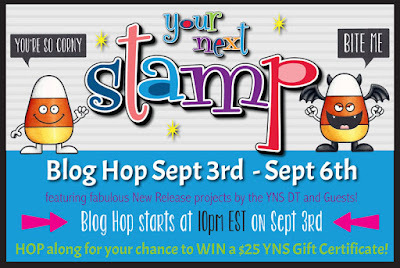 Be sure to check out all the fabulous creations on the YNS Blog from the DT showcasing this super awesome release!! Thanks for stopping in and hope you have a great Labor Day weekend!